With March Madness beginning this week, college basketball fans across the globe use the tournament as an excuse to get together and watch sports. In an effort to be more manly, I decided to feature some easy appetizer recipes that can be made in a jiff for having friends over to watch the games. Each day this week, I’ll feature a new, simple appetizer. I’m also open to featuring your favorite recipe! Just email me! First up, a Bonkowski favorite. 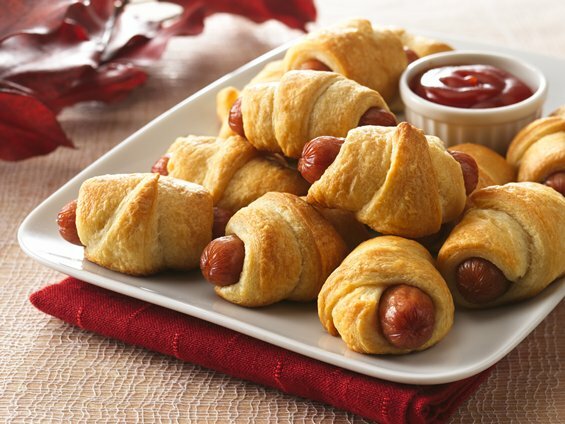 Teenie Weenies or Pigs in the Blanket. I feel like the Midwest folks call these Pig in a Blanket, but I reserve that name for the meat wrapped in cabbage dish my gram makes. • Heat oven to 375°F. • Separate dough into 16 triangles. Cut each triangle into thirds lengthwise. Place sausage on shortest side of each triangle. Roll up, starting at shortest side of triangle and rolling to opposite point. On ungreased cookie sheet, place rolls point side down. • Bake 12 to 15 minutes or until golden brown. Serve warm with ketchup, horseradish and mustard. The crescent rolls are a bit sensitive in some ovens. Be careful that you don't burn your buns!